The C.A.S.P.I.R. Paranormal Team in Discover St. Clair Magazine! This entry was tagged Alabama, C.A.S.P.I.R., CASPIR, CASPIR Paranormal Team, central alabama society for paranormal i nvestigation and research, creepy places, demons, discover, Frank Lee, ghosts, in the news, magazine. Bookmark the permalink. Paranormal King Radio brings you another action packed hour with the founder and lead investigator from the C.A.S.P.I.R Paranormal Team as we continue to look for answers. Who better to fill us in on answers than a man from one of the best teams the field has to offer that only cares about helping others with the investigations of spirit while preserving history, not to mention our Tuesday radio host on his Paranormalities and Ponderings radio show none other than Frank Lee. Happy Labor Day from the C.A.S.P.I.R. Paranormal Team! The C.A.S.P.I.R. 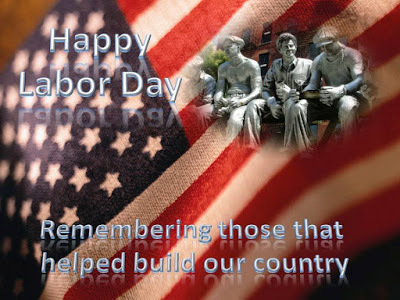 Paranormal Team wishes you all a happy and safe Labor Day! 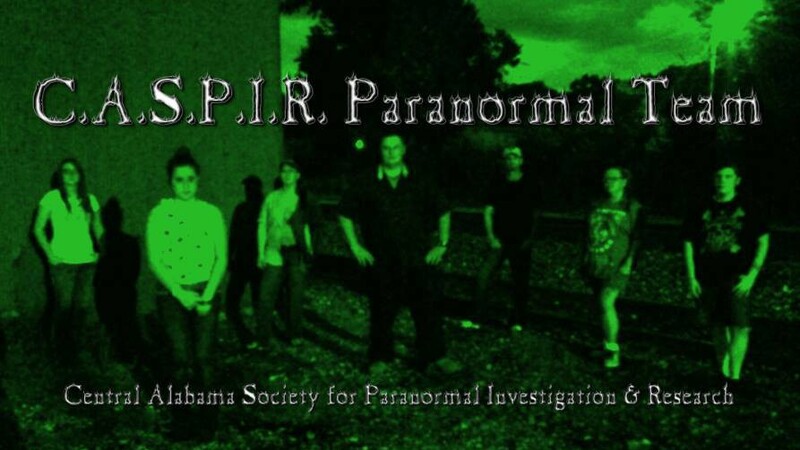 This entry was tagged C.A.S.P.I.R., CASPIR, Central Alabama Society for Paranormal Investigation and Research, ghosthunters, ghosts, haunted, Labor Day, paranormal, paranormal team. Bookmark the permalink. Here you see our director / lead investigator, Frank Lee, taking on the Ice Bucket Challenge. Who does he nominate to be next? You’ll have to watch to see! This entry was tagged Alabama, ALS Association, CASPIR, CASPIR Paranormal Team, Frank Lee, ghost adventures, ghost hunters, ghosts, hauntings, helping others, Ice Bucket Challenge, paranormal, paranormal activity, youtube. Bookmark the permalink. Join us Tuesday August 26th @ 6pm PST / 9pm EST with host Frank Lee from the C.A.S.P.I.R. Paranormal Team, as we talk with Blaine Rohan, an extremely knowledgeable spirit medium and paranormal researcher since 1984. Blaine has been seeing and hearing spirits since the age of 4. He feels that his life’s mission is to help others at no cost. He does a fantastic job at removing unwanted spirits from homes and can provide details/insight into places his team investigates that their equipment cannot. He is an educator, speaker, and mentor in the paranormal community and co-hosts The Scare Show. By day, he is an A+ certified computer technician. Blaine is a member of Spirit Communications and Research – S.C.A.R.E.and his team describes his role and assistance with their cases as invaluable. He strongly promotes educating the general public about paranormal phenomena and the way paranormal teams truly operate vs what is seen on television. Blain also stands for paranormal investigators educating themselves to better serve their clients. Even though he has abilities as a spirit medium, his mindset is grounded in science and he believes in using a common sense approach to investigations. This will be a great, information-packed show! Don’t miss out and we’ll see you there! 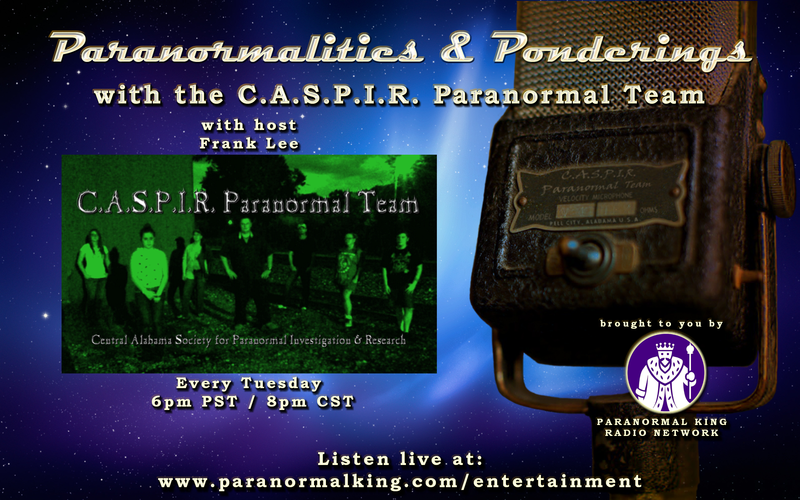 Introducing the Paranormalities & Ponderings radio show hosted by Frank Lee and the C.A.S.P.I.R. Paranormal Team! Dont miss out! Be sure to join us live every Tuesday night for an entertaining and educational radio show hosted by C.A.S.P.I.R. founder and director, Frank Lee. Instead of only bringing you the same few celebrities whose stories you’ve already heard countless times before, we will be bringing you the real people in the field who make things happen… the untold stories and unknown accounts. This is where you truly hear of new technology, new techniques, and untold encounters. You can simply tune in and listen or you can sign in to the chatroom and chat with other listeners, the host, and guests live during the show! The listening link and chat is compatible for mobile users on Android, IOS, and Windows Mobile also. This entry was tagged attachment, C.A.S.P.I.R., CASPIR, children, demons, Frank Lee, ghost, ghost adventures, ghost hunters, ghost stories, haunted, haunting, imaginary friend, paranormal, spirits, team. Bookmark the permalink.